Restoration Electroplating - History Brisbane, Queensland, Australia specialise in Silver, Gold, Brass, Copper, Chrome, Nickel, Tin, and Zinc and the polishing of metals. 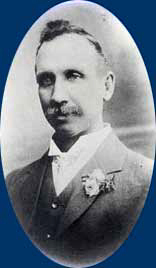 Samuel Cook arrived in Brisbane on 23rd October 1883. He was born in Radford, Nottingham on 22nd May 1857 and married Rose Ann Dean in St Mark's Church, Birmingham, Warwickshire. Their first child, Emily, was born in Birmingham in 1877 and their and their second child, Jane, was born in Sheffield in 1881. Sometime between the births of these two children they moved to Sheffield. Then on 19th August 1883 they sailed from Plymouth aboard the Duke of Devonshire, bound for Australia. The family moved into their home in Jay St. Red Hill in 1884 and Samuel worked as an an iron worker for Watson Bros. plumbers. In 1890 he began brass burnishings either under his house or in a shed in the back yard and in 1895 began electroplating. In 1900 he moved into the city. S Cook and Sons registered name is S. Cook and Sons Sheffield Plating Works. The business was given the name as that was the town Samuel came from in England. However it is well known throughout Brisbane and in fact Queensland simply as Cooks. Samuel worked as a brass burnisher in both Birmingham and Sheffield. 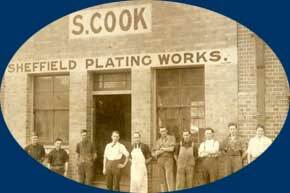 It is the longest established electroplating works in Brisbane. Over 30 men were employed at one stage plating in nickel chrome, tin, cadmium, zinc, silver, copper and brass and also doing bronzing and repairs. Samuel died in 1918 and the business was continued by his only son Samuel George who was joined by his sons Selwyn and Ray as they reached working age. Samuel George died in 1979. Selwyn's wife, Phyllis operated a depot in the Elizabeth Arcade for a number of years until Selwyn retired in 1978. Ray and his wife, Claryce, then conducted the business entirely from the Milton premises and decided to specialise in restoration of silver, brass and copper. Daughters Robyn and Heather joined them in the business. Robyn left shortly after her marriage and Heather's husband, Lance Hutchinson joined us just before their marriage in 1981. They now manage the business. Selwyn's son, Kerry and Ray's son Ian each chose different fields and did not enter the business. The premises at 45 Charlotte St were built by Samuel George in 1922 and sold by him in 1973 and demolished in 1983. The business then moved to the Milton premises which were purchased in 1962. In 2001 our building was resumed for the Lang Park Redevelopment. We were forced to move out to our current location at 1150 South Pine Rd, Arana Hills. During the war hand-grenades pins were plated, boat propellers polished and balanced and submarine propellers polished and balanced and submarine propeller shafts were cadmium plated. At one stage hundreds of bumper bars were chrome plated each week but these days its only vintage or veteran cars which have chrome plated bumpers. During the 74 flood the premises in Charlotte St which we had vacated a few months previously were not effected at all but the building at Milton to which we had moved was flooded over the ceiling but very few articles were lost - they simply floated down again as waters receded. The saccharine sweet smell of the nickel brightener could be noticed as soon as one rounded the corner of Albert St into Charlotte St - 100 yards away. However, the various chemicals used over the years do not seem to have effected the health of the family. Samuel George worked in the shop well into his eighties, Ray to almost 69 years and a few employees for almost 40 years to retiring age.